Selenium is a powerful antioxidant, which plays an important part in the antioxidant enzyme glutathione peroxidase, which is considered the most important factor in resistance to free radical damage at the cellular level. 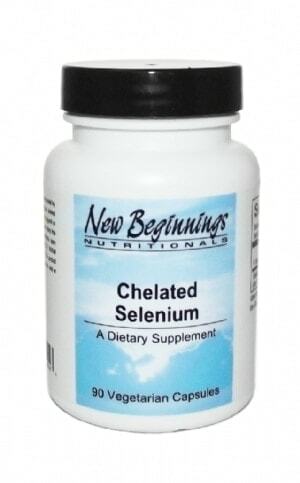 Low levels of selenium have been implicated in many chronic disease states. Because this very important trace mineral is mostly found in dairy and whole wheat, diets lacking in these foods will be deficient in selenium. Adequate levels of selenium are needed to support the immune system and the body’s detoxification process. It is also thought to affect eyesight, liver function, heart health and skin health. 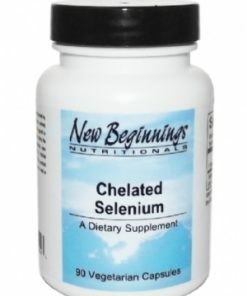 One capsule of New Beginnings Chelated Selenium supplies approximately 200 mcg of the trace mineral selenium. It is best to give selenium at least 30 minutes before, or two hours after giving vitamin C.